Picture a slow walk on a chilly winter’s morning. The sky is still tinged with pink and the sun is still hiding behind a mountain. You walk through the fresh mountain air, breathing it deeply into your lungs as your boots crunch on its surface. Eventually, the first sunbeams begin peeking over the mountain, illuminating the sparkling frost crystals left overnight on every surface. Suddenly, you are immersed in a magical twinkling world, with bright sparkles everywhere you look. You notice how the snow under your feet is a million shades of white. In those moments of calm winter beauty, you can feel the magic soaking into your soul. This tea was created in honor of such winter mornings, those quiet walks of reflection in a world transformed by snow and ice. It’s especially appropriate just after the holidays, when time seems to finally have slowed down a bit and many are in the mood for gentle reflection. In mid December, we might have been too rushed or distracted by visiting friends and family, holiday plans, and so many activities… but now feels like an exhale. A pause. A time to slowly and mindfully sip a very special cup of tea. Yes, that sparkling branch in the cup in the picture is, indeed, tea. I made it by growing sugar crystals on a spruce branch, which takes a couple of days and then makes an extraordinarily beautiful presentation. 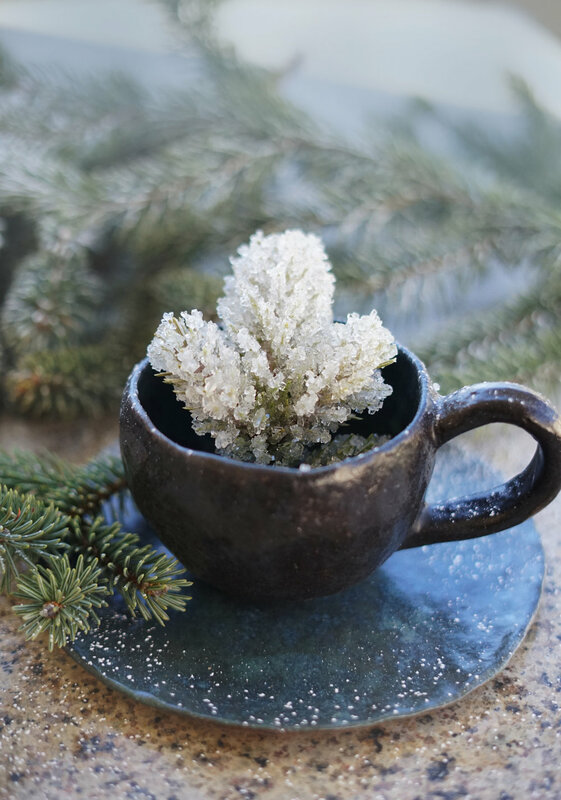 Try growing several branches and serving them at a tea party to share that winter beauty with your guests! This is the perfect way to recycle parts of your Christmas tree, as long as it’s clean and organically-grown and is a fir or spruce. 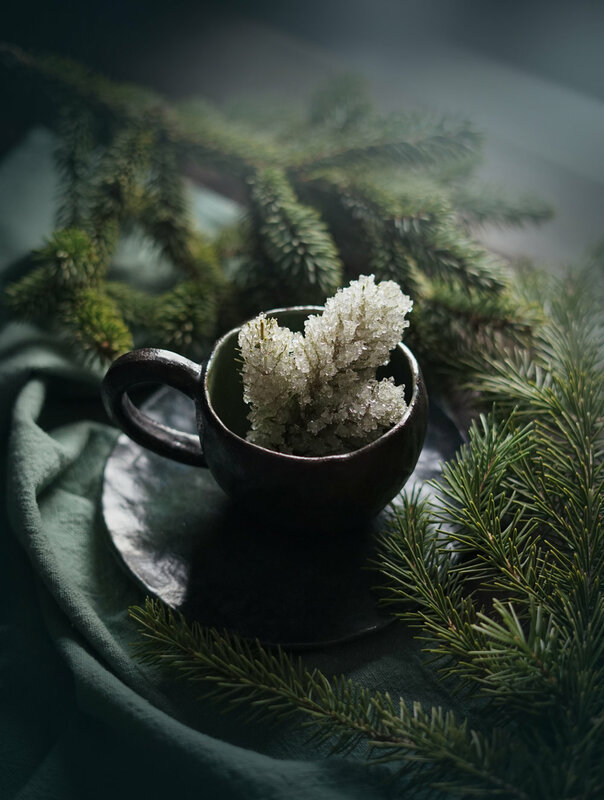 *Tip: you can also pour another flavor of herbal tisane over the crystal branch for a more layered tea, but I prefer the beautiful simplicity of the sweetened conifer alone. To make the experience that much more magical, layer it with the reflection ritual below! Paint the tips of the branches with the syrup and sprinkle sugar over them. Allow to dry until completely dry, or overnight. The next day, you’ll need to make a saturated sugar solution. This means dissolving as much sugar into water as the water will hold. Determine how full your jars will need to be to cover each spruce branch. Measure it out in cups. Pour half of the water into a medium saucepan. Add an equal part of sugar and stir to dissolve. Then, add more sugar, ¼ c. at a time, stirring until the sugar crystals are no longer dissolving. Be patient- this step can take some time and if you rush it your crystals will be very small or won’t grow at all. While you or a friend are doing the above step, prepare the branches. Gently shake them to release any un-attached sugar, then suspend them in the jars, making sure they aren’t touching the bottom or edges of the jars. I find it helpful to tie them to a skewer, then place that over the top. Once your solution has taken all the sugar it can, heat it over a low heat and continue stirring. As the liquid heats, the solution will be able to absorb more sugar. Continue with the process until the solution is warm (but not simmering) and won’t absorb any more sugar. Take the pan off the heat and allow to cool to a warm room temperature. (A crust of sugar may form on top; just skim it off. Pour the warm (but not hot!) sugar solution over the spruce branches, then cover each jar with a small piece of parchment paper. Leave undisturbed overnight, or until you can see crystals forming on the branches. When they are your desired size, gently remove each branch from the jar, allow excess syrup to drip off, and hang to dry. 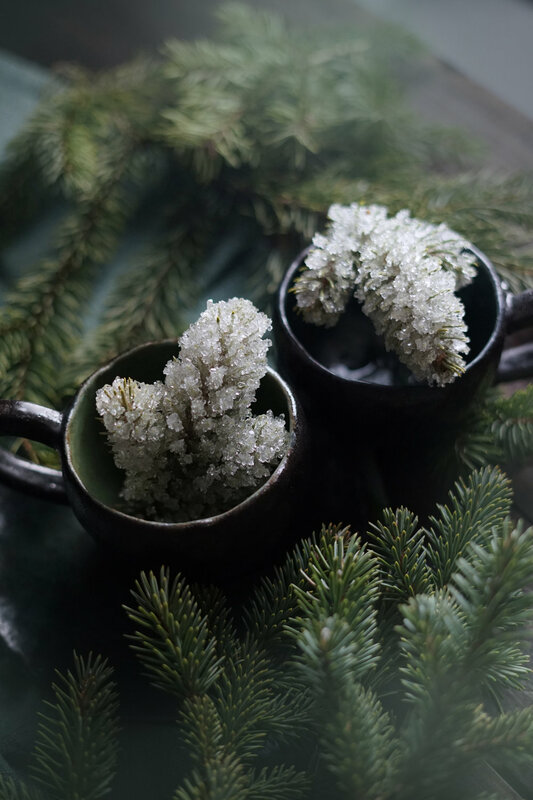 *Tip: the leftover sugar syrup can be used as a conifer-flavored syrup in cocktails, drinks, or confections! 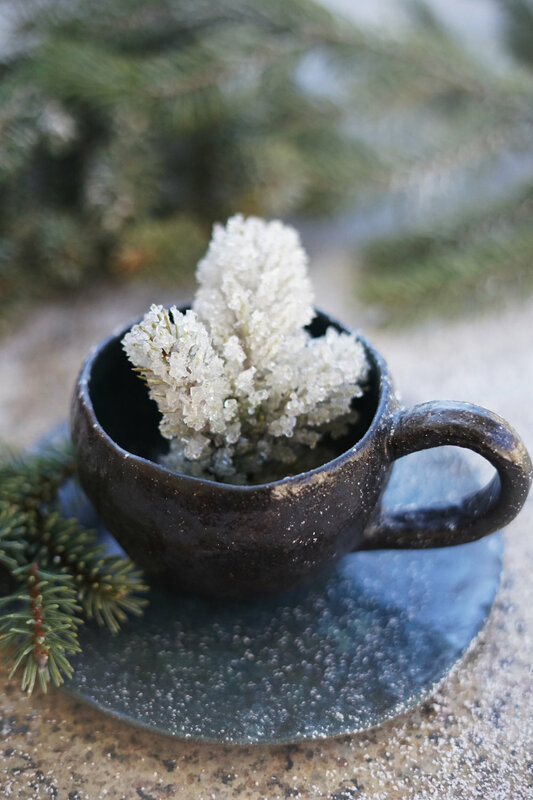 Place your tea cup with sugared branch and a pot of hot water in front of you. Pour the hot water over the branch and inhale the steam, which will smell fresh and wintery. Watch the sugar crystals slowly dissolve. As they dissolve, picture whatever is stressing you dissolving away as well. Pay attention to each sip in your mouth, the way it feels to swallow, the way it tastes, the sweetness, the aroma. Each time you swallow a sip, imagine that it is carrying magic deep into your belly, where it will radiate out through your entire being. When you’ve finished your cup, close your eyes and take a few deep breaths. On the exhale, release what you want to release. On the inhale, breathe in what you desire. Once you’ve finished this simple ritual is a great time to do some intention journaling. It may help you to know what you want to focus on this year or where your energy will go as you move forwards into a new year and a new start.